Introduced in May 2013, the Samsung NX2000 is the firm’s upper entry-level mirrorless model sitting immediately above the NX1100 but beneath the new NX Mini and NX3000. The NX2000 is based around the firm’s 20.3M-Pix CMOS sensor and features the firm’s new DRIMe IV level processor permitting a doubling of the maximum sensitivity up to ISO 25,600 over the entry-level NX1100 as well as in-camera lens corrections and a HD 3D video capture option (with the appropriate lens). In terms of hardware features over the NX1100, the NX2000 gets a 3.7” 1.15M-dot LCD touchscreen and adds the convenience of NFC to WIFI. In most other respects the two are similarly specified. Like its sibling the NX2000 can capture bursts up to 8 fps and record Full HD video at 30fps and 24 fps but while the new model adds stereo audio, Samsung has dropped support for the full-size SD card choosing MicroSD (with support for UHS-1) instead. Despite the bigger screen, the NX2000 is only slightly larger than the NX1100 at 4.7 x 2.5 x 1.4″ / 119.0 x 64.5 x 35.7mm and it remains light in weight at 8.04 oz / 228g. 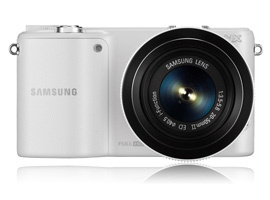 It is available now at $549 including the Samsung 20-50mm f/3.5-5.6 zoom lens. 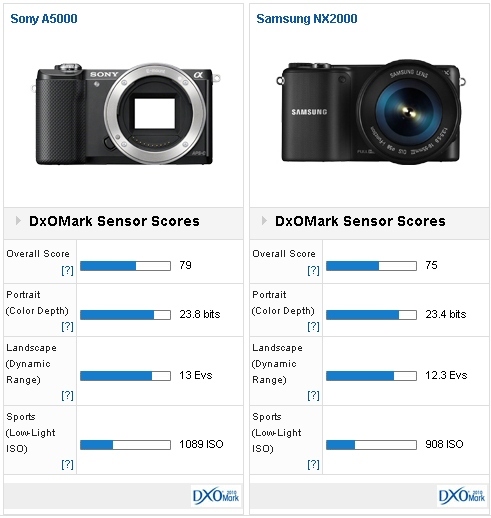 The 20.3-Mpix CMOS device in the Samsung NX2000 achieved a DxOMark score of 75, placing just ahead of the NX1100 and alongside its siblings the NX300 and NX30, but slightly behind the current Sony NEX and Alpha models including the competitively priced Sony A3000. At around $449 with the 16-50mm the new 20.1-Mpix Sony A5000 is not only $100 cheaper but it has WiFi with NFC, HD video up to 60 fps and a slightly smaller 3-inch yet tilting LCD. 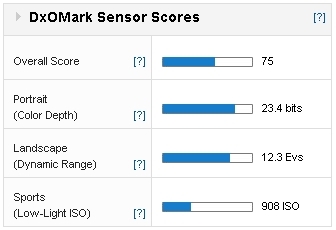 It’s also technically ahead in our sensor ratings with a DxOMark score of 79 points. Color and Low-light capabilities are on a par but the Sony has a +2/3 stop advantage in DR at base ISO. 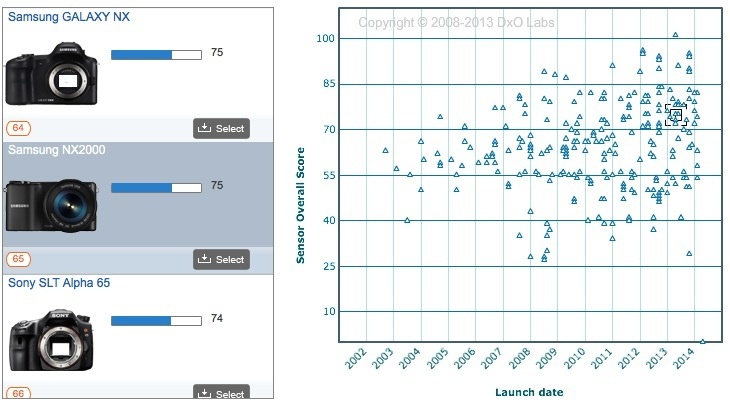 In the real world there’s not much between the two sensors in performance terms. The NX2000 sensor has good color depth and low-light capabilities but dynamic range is a bit of let down compared to its closest rival the Sony A5000. Still the NX2000 has a comparable feature set and Samsung’s lens line up is gathering pace – it may be a contender but it loses out somewhat on value due to Sony’s aggressive pricing.